Robert´s idea is to complement his songwriting capabilities with the "helping hands" of excellent artists and innovative producers. Robert is utilizing the internet and pursuing the idea of a conceptional studio band with a frequently changing lineup of artists. He calls this project the "Rob B. Project" since he supplies the melodies and often the lyrics of a song and other musicians/producers contribute their talents and skills to make it come to life. Robert has been collaborating with many international music talents, hoping that someday soon his songs will get played on radio stations around the world. What started as the realization of a lifetime dream for Robert has evolved to become serious business. 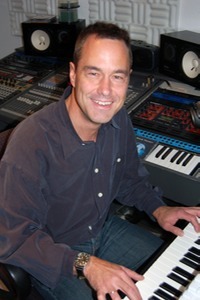 If you are looking for a songwriter, lyricist or producer, don't hesitate to contact him. Comments regarding "Did You Get What You Want"
"Yes I did listen to your song and was surprised at how good it sounded, very well produced. I really do think it has potential for airplay with a professional promoter behind it." "Yes I like the song and it has potential. That´s why I contacted you." "...a few days later it was already rotated as `Hit Pop`, which means it is played about every 4 hours. It´s a good song and it fits our format." "Our editorial department liked the song and we will play it approximately once a day." "This song is wonderful as it is. Finding the right market might be awkward, but this song demands to be heard." "I have to say I was positively surprised - there is something special about the song. It reminds me of George Harrison, the Traveling Wilburys, Tom Petty, etc." "We think this song deserves to be played on your stereo." "This is a hit, isn´t it? I think it is good enough to be frequently played on American radio stations that focus on timeless sounding music." "Your lyrics are sensual and extremely well worded, with a magnificent flow. The music has a strong Pop appeal with a nice 70´s vibe that the listener won´t be able to get enough of. The title is a perfect choice." "Many SWR3 listeners have just phoned us and sent emails to our studio... Hey, Rob B. featuring Andrew Gold, they have a hit. Their song is a hit!" "It sounds really promising. We would like to present the song as our Hochstift Hit of the Day." "Of course the production is very professional and clean. From a technical/production standpoint this song could be immediately broadcasted." "After the song was broadcasted our editorial office experienced a very positive response. Scores of listeners phoned us because they liked the song so much. Most of them asked where they can buy the CD." "Your vocals are superb! The musical composition is potent and lively with compelling musicianship and outstanding melodies. The arrangement flows seamlessly with the progression. The production has outstanding qualities throughout the entire song. Great Job!" "Did You Get What You Want really is a very WAX song, and I think you have done a magnificent job in getting it recorded. I look forward to seeing your name in the credits on the next WAX album, because this truly is where it belongs." "Now I´ve heard it.....It IS a good song! !.......My opinion only, but I heard traces of Andrew Gold (solo-material), The Eagles, Tom Petty, Dylan and The Wilburys.....The vocals kick and the instrumentation is perfect....Hope it´s on Andrew Gold´s next." "Your song is being played on our daily rotation (our best) airing 5-6 times per week." "I got a lot of positive feedback from our listeners. It´s really a great song! I will keep it on our playlist." "Perfect adult pop. Damn good ear candy for the mainstream audience. This is easy listening at its best. Mainstream at a high level, typical American music." "I have played your single three times asking the listeners to guess the artist. A few Paul McCartney´s and several E.L.O/Jeff Lynne guesses. They all love it. They say it sounds familiar yet contemporary. I think you are on to something!" "...we really do like the song! We´re currently playing it in high rotation(which means 4 times a day). Please contact us again if you have recorded a new song!" "The kind of hook I´ll walk away singing to my kids, my friends, my ex´s: `Did You Get What You Want?` I can sing this catchy melody for so many situations and before you know it, they´re singing it too! It´s more than pop on the west coast. It also has a southern country flavor sound that I feel would make the right male performing artist take it to the top of the charts in Nashville and other large ciries around the country, too. Robert, you and Andrew have done a fantastic collab with excellent lyrics and excellent sound."